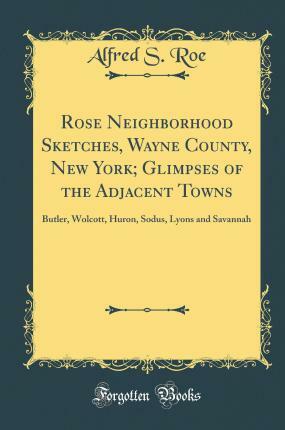 Excerpt from Rose Neighborhood Sketches, Wayne County, New York; Glimpses of the Adjacent Towns: Butler, Wolcott, Huron, Sodus, Lyons and Savannah As the school district, in its political and social relations, comes nearer than the N. Y. Town to the principle of self government and to intimate acquaint ance, I have made that the unit in my story. The dates at the head of each chapter tell when the matter appeared in the Clyde Times. To com prehend fully the time involved, the reader must have the sliding temporal scale in mind. All changes, since the first writing, are indicated by paren theses. In making the book I have had to leave out much. It has been a choice of materials. Anecdote and incident that would add a fourth to the volume, have been elided. The genealogical data have been given in passing rather than in separate chapters. I have aimed to make the narrative one of today, a series of events now passing, rather than one of yesterday, all in the buried past. About the Publisher Forgotten Books publishes hundreds of thousands of rare and classic books. Find more at www.forgottenbooks.com This book is a reproduction of an important historical work. Forgotten Books uses state-of-the-art technology to digitally reconstruct the work, preserving the original format whilst repairing imperfections present in the aged copy. In rare cases, an imperfection in the original, such as a blemish or missing page, may be replicated in our edition. We do, however, repair the vast majority of imperfections successfully; any imperfections that remain are intentionally left to preserve the state of such historical works.